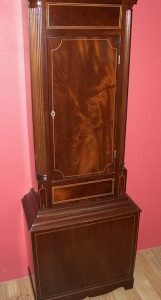 Nicely proportioned mahogany cased longcase clock inlaid with satinwood made by James Colhoun. With reeded quarter columns to the trunk, bracket feet and swan neck pediment to the hood. 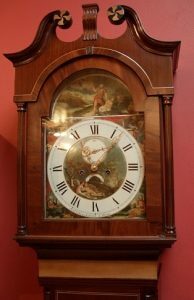 13″ painted dial with Roman numerals and signed “J. Colhoun & Sons, L’Derry” with supplementary seconds dial and crescent shaped date aperture. 8 day movement striking a bell on the hours. Fully restored with one years guarantee. Ref: m5870.